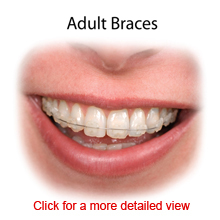 More and more, braces are becoming very popular among adults. Adults realize the importance of a beautiful healthy smile and preventing future dental problems. There are a variety of braces to choose from; some are barely even noticeable. Orthodontics can correct crooked teeth, missing teeth, crowed teeth, and extra teeth. Braces can fix bite problems and jaw misalignment. Some adults that wore braces as teenagers get braces again because their teeth have moved. In such cases, braces may only need to be worn for a short period of time. Orthodontic treatments can prevent premature wear, tooth decay, gum disease, and future dental problems. Orthodontic treatment is very individualized. Your treatment plan is unique and specific to you. The type of orthodontics worn and the length of time that they are worn depend on several factors, including the complexity of your bite problems. There are a variety of orthodontic types to choose from. Today’s braces are more discreet than ever before. Orthodontics can be constructed of metal, clear plastic, colored plastic, or both. When the desired result is achieved, the orthodontics are removed from your teeth. Your orthodontist will take “after” treatment photos and make another mold of your teeth. This mold is used to create your retainers. Retainers are removable plastic pieces that are worn for various periods of time. They help your teeth retain their new position once your braces are removed.